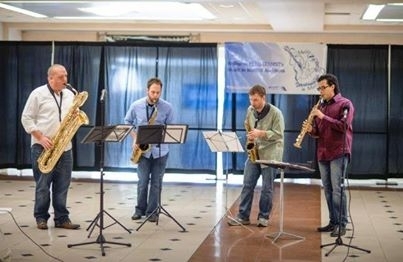 In the year 2003, while pursuing their undergraduate degrees at Montclair State University in Upper Montclair, NJ, four classical saxophone students began performing together regularly. Though changing members a few times, the group managed to stay together and has been a quartet ever since. They legally were named Garden State Saxophone Quartet, LLC in August of 2008, making their five-year commitment official as a group. The four members also perform regularly as free-lance musicians and are private teachers in their own studios, as well as some in New Jersey public schools. GSSQ has a wide variety of classical, pop, jazz, rock and holiday collections and will perform at any and all types of events. The Quartet has performed in venues such as the New Jersey Performing Arts Center in Newark, NJ; Kasser Theatre in Upper Montclair, NJ; The Peoples' Improv Theatre (PIT) and Ars Nova, both in NY, NY; and has also done charity performances for the Music at the Mansions Soiree for underprivileged children and wounded war Veterans in Closter, NJ. GSSQ has ongoing musical relationships with several New Jersey towns and schools, including the Town of Somerville, the Town of Pitman, Lazar Middle School in Montville Twp., Old Tappan High School, and Rutherford High School. Though the group travels all over the Tri-State Area for performances, they don’t forget where their roots are: in the Garden State. © Garden State Saxophone Quartet, LLC.